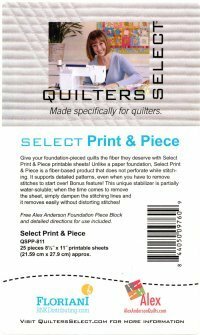 Give your foundation-pieced quilts the fiber they deserve with Select Print & Piece printable sheets! Unlike a paper foundation, Select Print & Piece is a fiber-based product that does not perforate while stitching. It supports detailed patterns, even when you have to remove stitches to start over! Bonus feature! This unique stabilizer is partially watersoluble; when the time comes to remove the sheet, simply dampen the stitching lines and it removes easily without distorting stitches.